Tropism: a growth movement in response to a stimulus. Plants grow towards or away from stimuli. A growth movement towards a stimulus is called a positive tropism. A growth movement away from a stimulus is called a negative tropism. Plant roots are negatively phototrophic while plant shoots are positively phototrophic. This is so they can get enough light for photosynthesis. Plants also produce hormones (or plant growth substances), like humans. Positive phototropism is caused by the plant hormones called auxins. Auxins are produced at the tip of a plant’s shoot where they cause the elongation of the cells. If a shoot is grown with light coming from only one direction, auxins move to the shaded side of the shoot. As a result, the auxins cause the cells on the shaded side of the shoot to elongate more, which in turn causes the shoot to grow towards the light. Auxins are also found in the root tips of plants where they have the opposite effect. 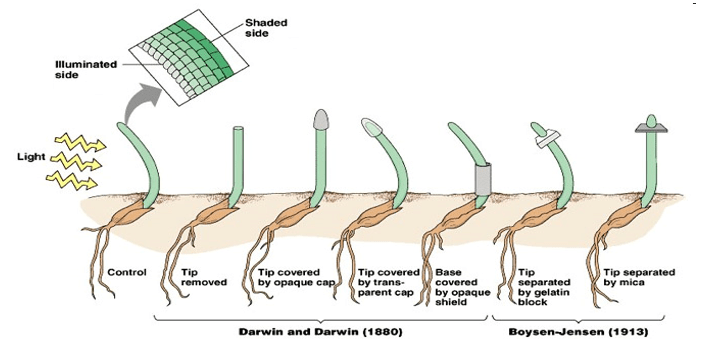 In roots the cells at the top elongate faster, and the root bends downwards. This helps plant roots to anchor the plant in place and to reach water and minerals underground. When a seed germinates, roots and a shoot start to grow. Some seeds need periods of darkness or cold before they will germinate. After this period is complete, the seed releases plant hormones called gibberellins. These hormones cause the starch stored in the seed to be turned into sugars that the seed uses for energy to grow. In some species, Gibberellins also stimulate flower and fruit production. Cytokinins – induces mitosis (causes plants to grow and flower and stimulates seed germination). Ethylene – Ripening of fruit and dropping of leaves.